The MDF® ER Premier™ is a robust and versatile stethoscope with superior acoustic quality that enables ER physicians and first responders to deliver fast and efficient emergency care to both pediatric and adult patients using just one stethoscope. Constructed from premium-grade acoustically-superior stainless steel, the MDF® ER Premier™ Stethoscope delivers accurate auscultation of heart, lung, and Korotkoff sounds with acoustic integrity and clarity. An ergonomic design ensures comfort for the doctor and patient, even during extended use. The ER Premier™ is the ultimate diagnostic instrument with unmatched performance, durability, and aesthetics. 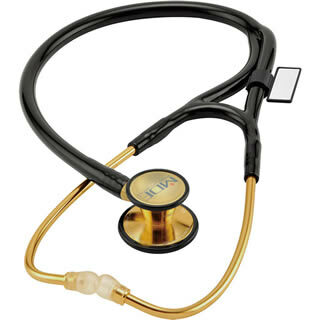 With the included cardiology bell conversion, this stethoscope can be easily transformed into a cardiology stethoscope.